Reading a book is an adventure. Something that takes away everything else and propels you into a different world. Some books you just click with, some books you really enjoy. Some books though, they speak to you, they embed themselves in you, never to be forgotten. You breathe these books, allow yourself to be consumed by them. You devour every single word, you feel every single emotion and you LOVE EVERY SINGLE SECOND. Some people have favourite books, some have favourite authors. Some have both. I have both. 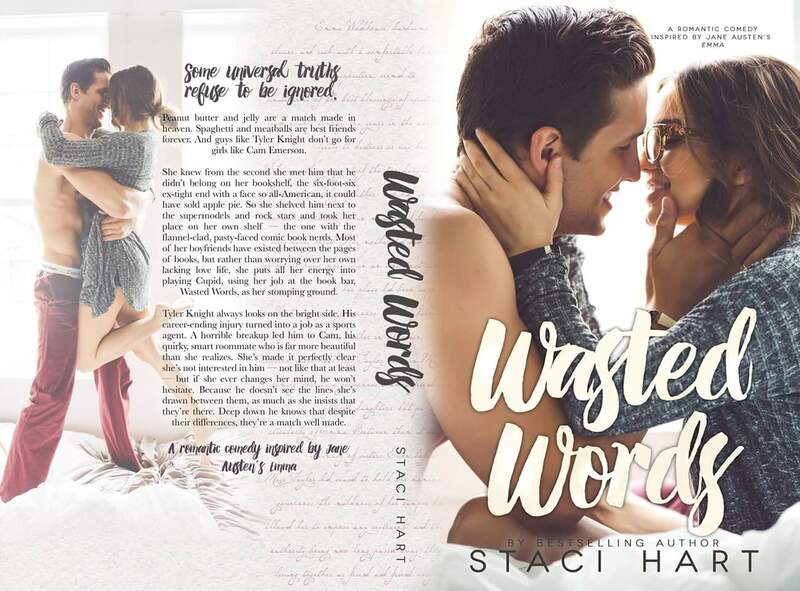 You see Staci Hart is a top, TOP author of mine. Her books speak to me on a level like no other. I LOSE myself every time I pick up a Hart novel and I drown in words that light up my heart and soul. Each and every time Staci releases a new book it becomes my favourite. After reading Last Call, I said I read one of the best books I’d ever read. Then along came Wasted Words. Going into WW I knew that by the end I’d be this soppy freaking mess, floating on a cloud of heavenly feels and ready to pour my heart out. But, now that I’m sat here, ten minutes after reading the final word I’m a soppy freaking mess of epic proportions. My heavenly cloud is a full sky and I don’t even know where to begin with the heart pouring. From the very beginning it was hard not to feel bubbles begin in my stomach, my heart kicked up a little faster. Slowly, blissfully, the bubbles grow and pop into butterflies that flutter. The closer Cam and Tyler became the stronger those butterflies kicked up, until I was left with freaking birds flapping through me. And that was just at the first kiss! As each and every chapter, perfectly named as always, progressed I found myself falling deeper in love. I mean Tyler, come on. He’s a walking, talking dream boat. Everything about him was just, well, perfect. No other words needed! But you know who I fell in love with more in this book.. CAM. That little fairy, sat high on her own shelf flew down and ripped me to shreds. I’m sure, and as much as I hate to say it, some people won’t like her, they’ll call her “weak” or whatever but THEY WILL BE WRONG. Cam is REAL! She is that person we all have in us, the one that knows our own abilities but still pulls ourselves down. Her anxieties/fears/issues are in everyone, we feel them or will feel them at some point. And those things are what solidified my love for Cam. I felt her, every single word resonated somewhere, every single fear was relatable and it made it all the more beautiful. Together Cam and Tyler are stunning. So perfect. Just everything. I want to burn with them, burn in their fire, because burning together is bliss. Countless times I felt myself trying to hang onto my emotions. It was pointless. They were ripped from me, along with my breath, my heart and my soul.. I highlighted so many parts of this book, took so many notes, stopped every couple of chapters just to breathe and calm the inner flames of Cam & Tyler but in the end it was no use. My smile couldn’t be any bigger, my heart couldn’t be any more full, my tears couldn’t be hotter. I’m dizzy, beautifully, blissfully dizzy. I’ve read one of the best books I’ll ever read, one that I will pick up anytime and fall in love with every time. This bookworm has fallen deep for the fairy and her giant. What happens when you let go? So freaking high, on the burning flames, TOGETHER.